The Topps NBA Rookie Photo Shoot Autograph Cards have become some of the most collectible basketball cards in the hobby, and this year, Topps takes the program to an all-new level. The popular set now features DUAL and TRIPLE autographed cards! There are now 9 different DUAL autographed cards featuring combinations such as Raymond Felton/Sean May, Felton/Rashad McCants and Deron Williams/Luther Head. 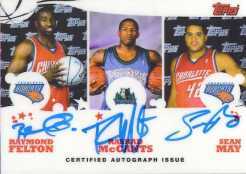 And there are four different TRIPLE autographed cards including the 2005 NCAA Champion U. of North Carolina combo Felton/McCants/May. There are only 14 copies of each of the dual autographs while the triple autographs are limited to just 10. The special cards, which are manufactured on the spot at the NBA Rookie Photo Shoot, represent a special moment for the NBA rookies as they get to see and physically hold their first NBA trading card. Each rookie is also given additional cards to give to family members, friends and fans (these cards do not include the 3M authentication sticker) and they even enjoy trading the cards with their future NBA counterparts. The cards can be found in the upcoming 2005-06 Topps Basketball, which hits store shelves early September and carries a $1.59 SRP for each 10-card pack.